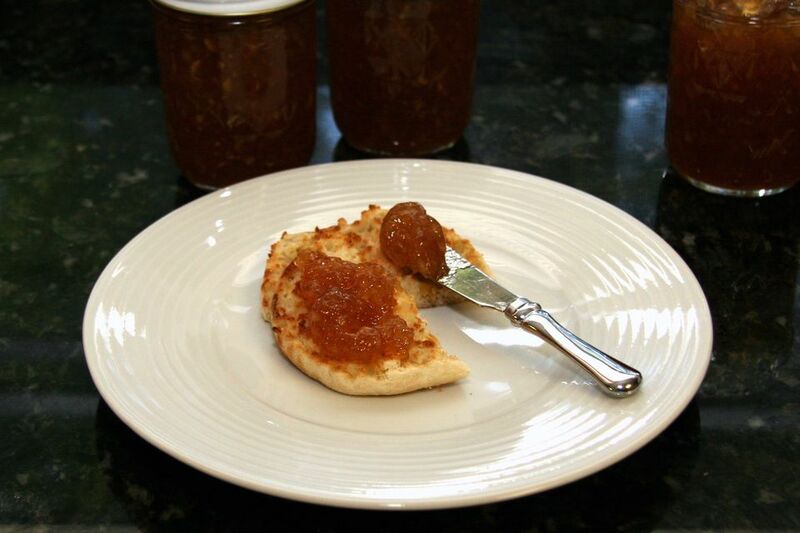 This pear jam is flavored with brown sugar and common spices. It's made with the addition of commercial powdered pectin. I used a food processor to grind my pears, but you could also use a food grinder or chop them finely. Fill a boiling water bath canner about half full. Add the empty jars and bring to a boil; reduce the heat to low. Keep the jars in the hot water. Fill a saucepan with water and bring to a boil; reduce heat to low and add the flat sealing lids. Keep the lids in the hot water. Grind or finely chop the pears; measure 4 cups into a large kettle. In a bowl, combine the fruit pectin with 1/4 cup of the granulated sugar; mix well. Add the pectin mixture to the pears and cook, stirring, over medium-high heat, until the mixture comes to a full rolling boil. Gradually stir in the remaining sugars and spices. Add the butter, if desired, to keep foam to a minimum. Stirring constantly, again bring the mixture to a full rolling boil. Boil for exactly 1 minute longer. Remove from heat and continue stirring for 5 minutes. Skim excess foam from the mixture, if necessary. Using tongs, carefully remove jars from the hot water, draining well. Fill them with hot fruit mixture, leaving 1/4 inch headspace. Wipe rims clean with a dampened cloth or paper towel and fit lids on tops of jars. Screw on the bands firmly. Lower the jars into the water and add more very hot or boiling water so the water is 1 to 2 inches above the jars. Bring to a boil. Cover and boil gently for 10 minutes. Remove the jars to a rack to cool completely. Do not invert.